The Arenal Volcano is the smallest volcano in Costa Rica in size and also the most active . Even though in the last few years there has been little to no lava action the volcano is very much alive, evident by rumbles and gas emisions! Volcan Arenal has been constantly active since 1968 when on July 29th the volcano erupted killing 78 people. The last eruption prior to this is thought to be around 1500 AD. The volcano is some 3000 years old and has an elevation of 1660 meters. Arenal Volcano is what's called a Stratovolcano meaning it is composed of both lava flows and pyroclastic material. Volcano Information - Arenal Volcano is an upside-down, cone shaped obtrusion, of dark, hardened material, scared with ruts and grooves carved by the smoldering boulders and lava that tumble down it's sides. It is the epitome of what a volcano is thought to look like. 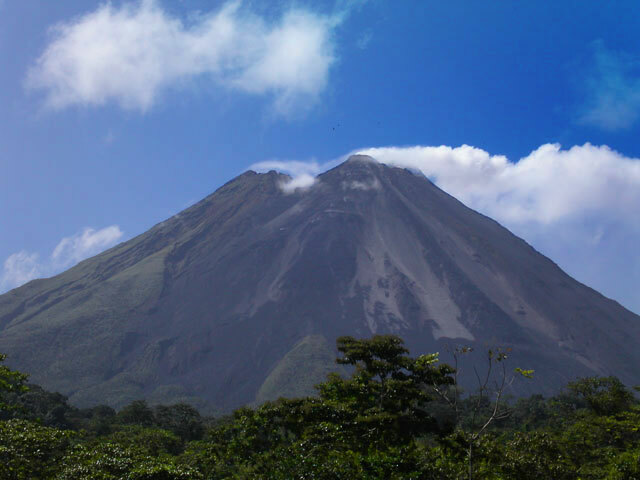 Want to take a guided hike to Arenal Volcano and also see the famous hot springs of Arenal Costa Rica? Click Here for more info. Volcano Information ...In recent years there have been several large explosions releasing pyroclastic flows that on one occasion killed two people. There are constant emissions of gas and water vapors. Pyroclastic flows can reach 1 kilometer of the crater (crater C. Total of three craters.) and often makes thunder like noises. Cerro Chatofound three kilometers S.E. of Arenal is now dormant with a lake in its crater which can be visited with a guide. In 1973 a dam was constructed, doubling the size of the Arenal Lake. 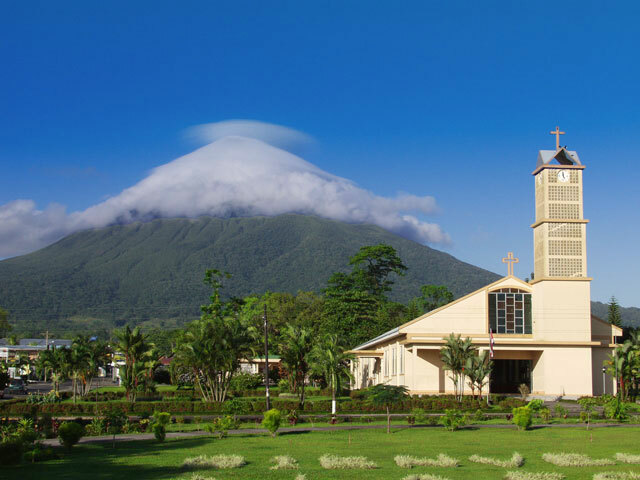 The old town of Arenal destroyed in the eruption of 68' now lies at the bottom of the lake. There is a new village called Nuevo Arenal located on the road in from Tilaran. 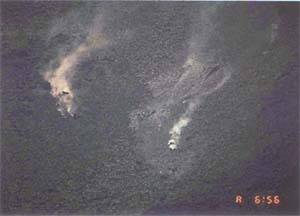 Also in1973 crater C became active. * Aug. 28, 1993. North wall of crater C collapses. Creating a V shape opening in the wall. * Aug. 26, 1997. A ten-passenger airplane crashed into the NE flank ~200 m below the summit. Arenal Volcano is in Top 10 of Active Volcanoes. Arenal Volcano is one of the most visited place in Costa Rica. There are a number of lodgings with spectacular views and also many less expensive hotels in the village of La Fortuna 6.5 km N.E. of the volcano. Volcanologists from the Observatorio Vulcanologico y Sismologico de Costa Rica and the Universidad Nacional, amongst others, are constantly monitoring the activity of the volcano. There are places to stay farther from the crater for those who are concerned about being so near an admittedly worrisome force. To see lava is an awesome experience! This is a place worthy to visit and statistically not very dangerous. There is a lot of information on this area so form your own opinion. Want to take a guided hike to the Volcano and also see the hot springs? Click Here for more info. http://www.volcano.si.edu/world/volcano.cfm?vnum=1405-033 - Lots of good information on the worlds volcanoes. While the "Global Volcanism Program" sounds kind of sinister - the sites is run by the Smithsonian so its probably all right. www.geologia.ucr.ac.cr/arenal/ - Some excellent images of Volcan Arenal. http://www.rsn.geologia.ucr.ac.cr/ - Red Sismológica Nacional (RSN: ICE-UCR) - We have taken the liberty to redistribute a document we found on their site that we found interesting. It is a report by Observatorio Sismológico y Vulcanológico de Arenal y Miravalles (OSIVAM), entitled, ASUNTO: Comportamiento del Arenal en los últimos días - and dated June 2, 2005.